Visit Chile’s Wine Country and taste some of the region’s best wines. 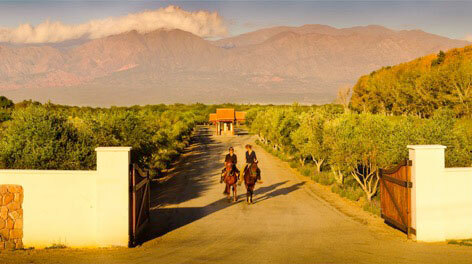 Enjoy a wine blending lesson and wine tasting in Mendoza surrounded by the Andes. Dine at some of the top restaurants in the area including Ruca Malen. Visit one of the highest vineyards in the world. Chile is a country of contrasts and striking beauty that offers an enviable combination of tourist security, natural wonders, and excellent services, making for a splendid journey or great adventure. 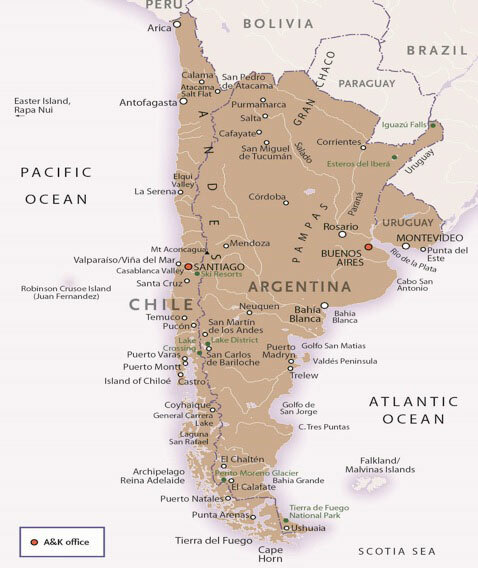 The longest and narrowest country in the continent, with a length of 2,700 miles and an average width of only 120 miles, Chile has a strong economy, a solid infrastructure, and a long tradition of democratic government. Chile is unique as it is the most southerly nation in the world and is separated from its neighbors by natural barriers. It is bordered in the north by one of the most arid deserts in the world; to the east, one of the greatest mountain ranges of the planet, the Andes, with heights close to 23,000 feet; to the west, the Pacific Ocean opens out; to the south, the Drake Sea and Antarctic Ice. Due to these natural barriers and extremes of nature, Chile enjoys a diversity not found elsewhere on the planet. It is this diversity with the heat of the deserts in the north, and the cold of the glaciers in the south that makes Chile known as the Land of Fire and Ice! Upon arrival to Santiago International Airport you will be met by a local representative who will assist you in collecting your luggage and passing through custom procedures before escorting you on a private transfer to Cumbres Lastarria hotel, pre-registered for immediate occupancy. Nestled in the historic Lastarria district, encircled by fashionable restaurants, museums, galleries, upscale stores, antique shops and theaters, Cumbres Lastarria boutique hotel offers an intimate accommodation with just 70 rooms and suites. Unwind in the fashionable lobby bar or savor creative cuisine and marvelous city views from the eighth-floor restaurant, Punto Ocho. The hotel also features a fully-equipped gym and a seasonal outdoor pool. In the afternoon you will enjoy a Santiago Walking tour. No matter which way you turn, walking the streets and neighborhoods of Santiago leaves you awed by its architecture and inspired by the art and culture. This four hour walking tour starts at the nearest metro station and our first stop will put us right in front of the presidential palace, La Moneda. From La Moneda we’ll pause in front of the historical yet still relevant Court of Justice, National Congress and former Customs (now the Pre-Colombian Art Museum) to reach the Plaza de Armas. As the heart of the city, dating back to the Spanish conquerors, this is where you’ll find the Cathedral, City Hall, Central Post Office and National Historical Museum. In the plaza you’ll see artists at work, various chess games and possibly a dance performance. Your tour will continue to the colorful and typical market of Santiago “Mercado Central”. This is the place where many Santiaguinos do their normal shopping; the market is full of fresh vegetables, fruits, fish and shellfish. Take a walk inside to appreciate the beautiful French architecture of the market. After this visit, continue to Lastarria neighborhood to explore by foot this peaceful area of the city which has a lively atmosphere due to the vicinity of the Fine Arts Museum, built on neoclassical style and the pleasant “Forestal” riverside park. A stop will be made in this area at one of the traditional local cafés to enjoy an ice cream or delicious coffee. In the evening you will have a pairing menu at Restaurant Casa Lastarria located walking distance from your hotel. In between the narrow streets and affectionate corners, a precious stone heart offers the optimal place to share and try an innovative gastronomical experience. Montes Winery was established in 1988 by four partners with years of experience in the art of winemaking and the wine trade. The philosophy was, from day one, to produce premium wines, a level of quality they felt was absent from the Chilean scene at the time. Premium wines quickly became the standard to follow, including Montes and Montes Alpha and their ultra-premiums, Montes Alpha and Montes Folly. This tour will take you around the beautiful vineyards, with their sweeping views over the Apalta Valley, and also to the barrel room, after which you’ll have the chance to sample four excellent Montes wines. After the tasting we will continue to the Colchagua Museum. This well-organized museum is the brainchild of the Cardoen Foundation, a not-for-profit organization that seeks to research, preserve and spread awareness of Chilean culture. The museum houses a diverse range of items from the relics of ancient settlers to machinery used throughout the history of Chilean winemaking. You’ll also come across rooms dedicated to weaponry, the Chilean huaso cowboy and the rescue of the 33 miners that made news in 2010. This really is a recommended visit, giving a comprehensive look at the Chile of then and now. After the visit to the Colchagua museum we will depart to Lapostolle vineyard where you will have the chance to be an enologist for one day and make your own wine. You will be staying the next 2 nights at the beautiful boutique hotel Noi Blend Colchagua. On your arrival at the Hotel you will be welcomed by the hotel’s staff and have time to settle into your room. You will enjoy dinner this evening at the hotel. After a leisurely breakfast, you will be transferred to Bisquertt Vineyard. For generations, the magnificent terrain of the Colchagua valley has yielded fruit under the attentive care of the Bisquertt family. More than 100 years ago, the first Bisquertts arrived in the Colchagua valley from the French Basque Country and they then began pursuing their goal of producing fine wine. On the tour you’ll get to visit the wine cellar and hear all about the winemaking, bottling and storage processes. This will be followed by a tasting of Viña Bisquertt’s excellent wines. We then continue to Vik Vineyard. Lunch will be at Viña Vik which is an exclusive vineyard and resort set in the rolling hills of Millahue, around 200 kilometers (124 miles) south of Santiago. Enjoy tours and tastings in the modern winery with a viticulture specialist before heading to the restaurant, where the floor-to-ceiling windows draw your attention to the stunning views of the surrounding forests and valleys. The restaurant serves a mix of Chilean cuisine with an international twist, creating an authentic ambience in the refined rustic setting. Whether you sit indoors or enjoy the outdoor patio, you will feel as if you are a guest in the owner’s home. Return to your hotel in the evening for a wonderful dinner. Upon arrival in Mendoza airport you will be met by your local representative and transferred to your hotel. This afternoon we will enjoy an intimate tour of the city of Mendoza, from the picturesque settings of the city’s many plazas, to the manicured grounds of Parque San Martin, with its bird’s eye view of the city, to the extensive shopping experiences. You will be feeling at home in Mendoza’s beautiful, tree-lined streets in no time! We will start the Orientation Tour discovering the history of Mendoza through the four main Plazas (Chile, San Martin, España and Italia), downtown, the shopping area and the financial area. The highlight is the Parque San Martin, considered to be the most beautiful Public Park in all Latin America. Designed by Carlos Thays, the Park was built in 1896. Today the park has an extension of 389 hectares, and contains valuable sculptures and monuments, an artificial lake, several pedestrian walks, over 5000 roses, and a campus university. A walk through the park is a must, and we strongly encourage you to discover the perfectly manicured trees and bushes that are the pride of the city. Tonight Blend, Visit, tasting & dinner at El Enemigo, Alejandro Vigil. Chief Winemaker of Catena Zapata Group Alejandro is, without a doubt, the winemaker who has obtained the most recognition in all of South America. With wines that have received 98 points, this young and innovated winemaker has position himself as one of the best in the world. His own wine line, El Enemigo has called the attention of the specialized international press. Tonight you will have dinner at his Estate in Mendoza and take a peek at his new creations that will be released to the market next year. Casa el Enemigo Winery is a small boutique winery that makes a very small production of outstanding wines, in a magical setting. The architecture of the place is based in the epic poem by Dante Alighieri, “Divine Comedy”. The space is full of small hallways that conduct to places like Heaven, Purgatory or Inferno. Definitely, a place to see and wines to taste! Today enjoy a full day of visiting some of the top wineries in Agrelo district. Bodega Catena Zapata – Catena Alta Tasting. The family winery led by revolutionary Argentine vintner Nicolas Catena, Bodega Catena Zapata is widely recognized as the pioneering winery which has shown the international wine community the true quality potential of the Mendoza terroir. International wine guru Robert Parker named Bodega Catena Zapata as the only South American winery in his book, The World’s Greatest Wine Estates. Finca Decero Once a patch of dirt in the foothills of the Andes, Finca Decero is a one-of-a-kind vineyard, where each vine is nurtured by hand and the winemaking is without compromise. Free from restraint and tradition, the creators of the winery developed a mano or by hand’ approach that is human, sustainable and sensitive to natural differences. Benegas Winery. This traditional winery belonged to Gladys Alurralde Norton’s family, mother of current owner Federico J. Benegas Lynch. Federico was born at the property’s main house, where he still lives today. Throughout his childhood he worked every step of the way, helping his father in the winemaking process. Benegas is focused on quality and celebrating its Finca Libertad terroir. They believe in the judicious use of oak, maintaining it as a background component in the wine, while tannins are balanced and the finish long. Total production is only 30,000 cases. Consultant winemaker Michel Rolland says: Benegas wines have a strong personality, the result of a unique terroir for its quality and the combination of French and Argentine traditions. The wines are a reflection of Federico Benegas Lynchs passion and his constant search for excellence. Today you will be treated to Lunch at Ruca Malen. Ruca Malén’s dream was born in 1998, when Jean Pierre Thibaud left the chairmanship of Bodegas Chandon Argentina after 10 years in office. In some meetings with Jacques Louis Montalembert, they talked about their common dream of having their own winery in Mendoza, a paradise at the foot of the Andes. They came to an agreement at once and started working together on the project of Ruca Malén, which would be devoted to producing premium wines, based on expert knowledge, on the magnificent lands of Mendoza and, above all, on a lifelong passion. In this way, some months later, Ruca Malén produced its first lot of wines, vintage 1999. Today Ruca Malen boasts the best lunch in the area, with fresh organic vegetables grown in the vineyard and with a gourmet six-step lunch paired with wines. This day combines the visit to the monumental architecture of Salentein Winery, Chapel and Art Museum with the hearty typical country food in Gimenez Rilli or Andeluna. After lunch, visit to Salentein’s Winery and Art Museum. There is no better way to learn the secrets of a regional cuisine than by cooking it yourself. We have teamed with the area’s best chefs to create an interactive cooking experience, which presents the region’s wide array of fresh produce and ingredients while demonstrating the local culinary techniques and highlighting some of the most authentic dishes. It’s not all about learning, however. You will have the chance to feast upon the fruits of your labor with special wines hand selected by us to pair with your personal creations. Preparation of several dishes (traditional with fires in Gimenez Rilli and Gourmet in Andeluna), recipe booklet, wine tasting and visit to the winery, Lunch, wine and waters. After the tour you will be transferred back to your hotel and the rest of the day will be at your leisure to relax. At a pre-arranged time you will be met by your local representative at the hotel lobby and transferred by a private vehicle to Mendoza airport to board your flight to Salta. Suggested flight AR2563 Mendoza to Cordoba and AR1819 Cordoba to Salta. Departs 1450 Arrives 1845. Upon arrival at Salta airport, your local host will meet and transfer you to Cafayate. Dinner will be at our hotel. Late morning, we visit a winery and its vineyards; participate in a wine tasting at San Pedro de Yacochuya, one of the best wines of Cafayate. The remains of the day are yours to enjoy Cafayate. Maybe more wine tasting at our hotel’s winery, explore the town on your own or simply relax at the hotel’s beautiful pool. Tonight we enjoy a traditional Argentine barbeque at the hotel. Today you visit the Quilmes Ruins and Pachamama Museum. We take to the road in our 4x4 to reach the mythic Road Nº40. We stop to see the Ruins of Quilmes. They belonged to the Calchaquí natives who settled on the hillsides and on the mountain range called Calchaquí. The huge mountain that seems taken from a fairy tale is a stone fortress. The pens and cacti have contributed to the development of these communities that raised animals and grew quinoa, corn and other plantations that helped feed the people. The highest part of what today we refer to as the ruins was the place chosen by the locals to set their defense against the enemy. First, there were other tribes and eventually the Spanish conquerors who found a strong resistance upon arrival until they were able to impose themselves. Tonight you will enjoy a wonderful dinner at your hotel. We head North on the famous Road 40 and on the way to Cachi stopping at Bodegas Colome owned by the Hess family for a visit to the winery and the James Turrell Museum. We then continue to Salta city for the flight toIguazu. Suggested flight AR2812 Salta to Iguazu Departs 14:20 Arrives 16:05. Upon arrival transfer to the Loi Suites Hotel located on the Argentine side of the falls. The rest of the day is at your leisure. Enjoy a full day visit to the Argentina side of the Iguazu Falls National Park. This side of park was created in 1934 and covers around 123,5000 acres (50,000 hectares), offering unique contact with nature as you get within a few steps from the thundering cascades. Feel the proximity of the falls and observe its beautiful vegetation, birds and butterflies, walking along the footbridges and roads; waterproof clothing is necessary, since there is a small price to pay for getting within such close range of the falls! Arriving at the Visitors Center, access the Nature Interpretation Center of Iguazu National Park, which also provides cultural, educational and social activities. This is the starting point for the amazing Devil’s Gorge tour. Departing from Cataratas Station, the train takes you to Garganta Station in 18 minutes. The stroll along the catwalks is 1.2km (one mile) across the delta islands, leading to the main balcony located next to the most spectacular fall, the Devil’s Gorge. Time required: two hours. Difficulty: low, no stairs. Upper Trail: a 2km-walk (1.5 miles) offering magnificent view of the falls from the Upper Iguazu River. Time required: 1.15 hrs. Difficulty: low, no stairs. Lower Trail: a 1.6km-walk (1.2 miles) provides a view from below and around the falls. Time required: two hours. Difficulty: moderate, with stairs. After this, we head off for a Great Adventure: climb aboard for an exciting truck ride through eight km (five miles) of riverside jungle following the Yacaratiá trail to Port Macuco. Here, embark a motorboat that navigates up the Lower Iguazú River, going through rapids to approach the falls at Garganta del Diablo canyon in the heart of the falls. A very wet ride is guaranteed, but so is a memorable experience. Important note: You will get wet. There are 100 meters (300 feet) of stairs. The ride is restricted for pregnant women and people with physical or medical problems. The Great Adventure is a shared program. You will then be transferred back to your hotel and the remains of the day is yours to enjoy. Meet with your local guide for a walking tour of the Brazil side of the falls. Upon arrival at the falls take a descending trail down the canyon, from where you can enjoy panoramic views of more than 240 falls. Then, board the glass elevator to a platform where more exquisite views will be revealed. Along with its “sister” park in Argentina, the Iguassu National Park forms the most significant remaining rainforest in the southern cone of South America which, along with the waterfalls, has been declared a National Heritage Site by UNESCO. In due time, your guide will transfer you to the airport to board your flight to Buenos Aires. Suggested flight AR1737 Iguazu to Buenos Aires Departs 14:25 Arrives 16:20. Upon arrival at Buenos Aires airport you will be met by your guide and transferred to your hotel. Explore the highlights of the South area of this magnificent city in a four-hour sightseeing tour accompanied by one of our experienced representatives who will introduce you to the history and culture of Buenos Aires, showing you the most significant spots. Discover the most important square of the country: Plaza de Mayo (May Square). Here is where the country was founded in 1580 and the most important governmental buildings are located, including the Casa Rosada (Government house), the Cabildo (City Hall) and the Cathedral Metropolitana (Metropolitan Cathedral). Nowadays it is possible to visit the Government Palace, so if you are interested, we will join one of the regular groups to tour the building. Walking down Defensa Street we will enter San Telmo, one of the oldest areas of the city. This neighborhood maintains a great part of its architectonic patrimony intact: colonial style houses, cobbled streets and a bustling collection of artists’ studios, ethnic restaurants, antique shops and boutiques. We will walk through the oldest and narrowest streets of this protected colonial district, with its famous cobbled streets to Plaza Dorrego. Discover the XIX century Buenos Aires. The area is home to some of the most important antique shops. After lunch start a sightseeing tour of the Northern area of Buenos Aires. You will visit Palermo, a district with different faces: a classic one in Palermo Chico and a modern one in Palermo Hollywood and Soho. Drive towards Palermo Chico with its impressive townhouses, tree-lined boulevards and parks. Continue to Palermo Park where you find the Japanese Garden, Rose Garden, Race track and Polo grounds with many important sculptures and lakes. Running along the side of the Park you can appreciate many wide tree-lined boulevards and mansions that house many an ambassador. Continue to Palermo Soho, which is a peculiar area that combines the flavour of an old, working class neighborhood with aspects of a globalized city including ethnic restaurants, contemporary design stores and theme bars. The bohemian atmosphere in this area makes it very popular with locals as well as foreign visitors. The choices for gastronomy in the area are wide and modern, for any kind of palate. Finally, you will visit the Recoleta neighborhood, which takes you back to the grand wealthy days of Argentina with many mansions to see along the way. This evening you will go to Rojo Tango, a unique venue located inside the Faena Hotel, to spend an amazing evening, an unconventional concept of Buenos Aires culture. Enjoy dinner and a tango show at a cabaret designed by Philippe Starck, created to bring back nostalgic times that already passed, with the strength of a performance full of fantasy and sensuality. Their talented dancers, musicians and singers will surprise you. Its gastronomic proposal with an attitude of its own, privileges the subtlety of perfumes and textures, accompanied by Baron B champagne. After the show you will be driven back to the hotel. This morning we will drive to San Miguel del Monte, the most traditional town in the Pampas to experience a bit of gaucho life in a typical Argentine Estancia, located at 2 hours driving distance from the city. 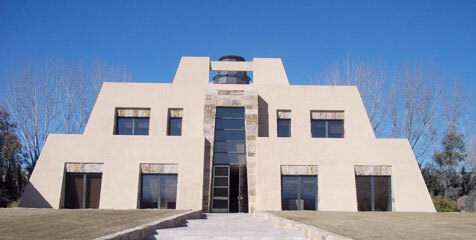 We our guests today at a family owned house, which is a sophisticated and elegant country Estancia. A beautiful park, from the 1830´s, guards the intimacy of the house and the swimming pool, with centenary Sycamores, Ginkgo Bilobas, Elms and a large variety of Pines that fragrance the air. In the distance, rustic and timeless, it opens up the endless plain landscape of “The Pampas” where the green tone of the land and the deep blue of the sky combine with scattered sights of cows and native horses, together with the isolated flocks flying high up. This is the perfect opportunity to take the time to experience the genuine gaucho’s pampas. A traditional barbeque lunch will be served for you to enjoy. At mid-afternoon you will be transferred to EZE International airport for your return flight home. Total cost per person based on double occupancy is $8093.00. Please note that the pricing is based on 15 participants. If the group size is under 15 then the cost per person increases $600.00. A minimum of 10 participants is needed for the trip to be guaranteed. Airfare from SFO is included in the price. The internal S. America flights are included in the price but price is subject to change until ticketed. Travel Insurance is optional and additional. The cost based on double occupancy is $561 per person or $595.00 for a single. A Brazilian visa is required to visit the falls. The cost for the visa is additional and must be purchased prior to departure. To confirm your space on this amazing trip a nonrefundable $500 per person deposit by check is required with a completed application form. Final payment is due by the 10th January 2018.